After the Disaster: American Rebirth or Interment? America is now in a time that in some ways resembles the 1850s, when freedom-loving people, attentive to political and cultural trends, saw a great crisis coming. After the Mexican-American War, as Southern slaveholders and their political allies sought to extend the realm of slavery into the West and tip the nation's political and cultural balance to the advantage of slaveholders, many believed liberty was at risk. In the wake of the Dred Scott decision -- in which the Supreme Court argued that the federal government could not prohibit slavery in the territories because enslaved human beings were a form of property protected by the Fifth Amendment -- Abraham Lincoln, then a Senate candidate, explained his own understanding of the coming crisis. 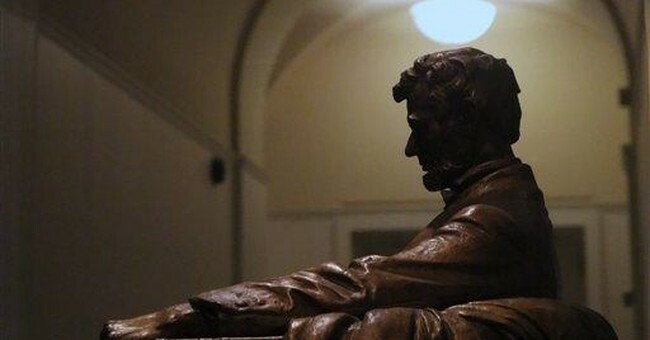 "I believe this government cannot endure permanently half slave and half free," said Lincoln. "I do not expect the Union to be dissolved; I do not expect the house to fall; but I do expect it will cease to be divided. It will become all one thing or all the other. Either the opponents of slavery will arrest the further spread of it, and place it where the public mind shall rest in the belief that it is in the course of ultimate extinction, or its advocates will push it forward till it shall become alike lawful in all the states, old as well as new, North as well as South." The question we face in this era is: Will America be a nation essentially organized around traditional families, largely free of government restraint, where individuals generally seek to order their lives according to the inalterable moral norms of the Judeo-Christian tradition? Or will it be a nation where the traditional family is essentially extinct, where people are largely dependent on government for some of their most basic needs and where the inalterable moral norms of the Judeo-Christian tradition are generally flouted and sometimes even criminalized? Back in 1930 (in inflation-adjusted 2012 dollars), the federal government took in $55.942 billion, spent $45.768 billion and ran a surplus of $10.174 billion. There were 122,775,046 people in the United States that year. So, inflation-adjusted federal spending was only about $373 per person. In 2012, the federal government took in $2.449 trillion, spent $3.538 trillion and ran a deficit of $1.089 trillion. As of September 2012, the last month of the fiscal year, the Census Bureau estimated there were 314,332,190 people in the Untied States. So, federal spending was about $11,256 per person. The federal government today spends 30 times as much per person as it did in 1930. Over the same span, the family and government's respect for it have disintegrated. Today, the Social Security Administration itself holds up Henry Rogers Seager, who was an economist at Columbia University, as the intellectual founding father of the Social Security system. In 1913, in an essay advocating a minimum wage law, Seager called for sterilizing Americans he deemed "defective." "If we are to maintain a race that is to be made up of capable, efficient and independent individuals and family groups, we must courageously cut off lines of heredity that have been proved to be undesirable by isolation or sterilization of the congenitally defective," wrote Seager in the Annals of the American Academy of Political and Social Science. When President Franklin Roosevelt asked Congress in 1934 to create the Social Security program Seager had envisioned, Roosevelt expressly argued that the time had come for Americans to depend on government instead of families and local communities. "So, also, security was attained in the earlier days through the interdependence of members of families upon each other and of the families within a community upon each other," Roosevelt said. "The complexities of great communities and of organized industry make less real these simple means of security. Therefore, we are compelled to employ the active interest of the nation as a whole through government in order to encourage a greater security for each individual who composes it." Ironically, Social Security from the outset was itself dependent on taxing away and redistributing revenue produced by the industrious activities of whatever children future American families would have. Following Social Security, later presidents and Congresses created disability insurance, Medicare, Medicaid and a prescription drug benefit all based on the same ironic cultural and fiscal rationale: Families could no longer take care of their own, but the federal government could tax future generations to fund government benefits for that purpose. The Obamacare mandates were the capstone of the welfare state: Everyone must purchase a government-approved health care plan, all those making over 400 percent of poverty must subsidize all those making less, most plans will cover surgical abortions and virtually all plans will cover the complete costs for contraceptives, abortion-inducing drugs and sterilizations. America's birth rate hit an all-time low in 2011, according to the Centers for Disease Control, and 40.7 percent of the babies born were illegitimate. America's potential for economic growth, the Congressional Budget Office argues, has declined in part because relatively fewer young people are coming of age than in the past. Those who do enter the private-sector labor force now face the brutal demographics of the welfare state: In 2011, 70.4 million Americans enrolled in Medicaid and 94.75 million worked full-time in the private sector. That means there were fewer than 1.4 full-time private-sector workers for each Medicaid enrollee. A young man and woman who marry, have children and both work to support their family must also work to support at least one other person on Medicaid. America is not headed toward another Civil War. But we are headed toward a great fiscal and cultural crisis. Whether that crisis results in America descending deeper into socialism and moral decay or a rebirth of traditional morality and limited government will depend greatly on whether there now emerge national leaders who understand what has happened to us and have the moral courage to speak it plainly.